Weekly Photo Challenge – Unfocused | Photograph: To draw in light. 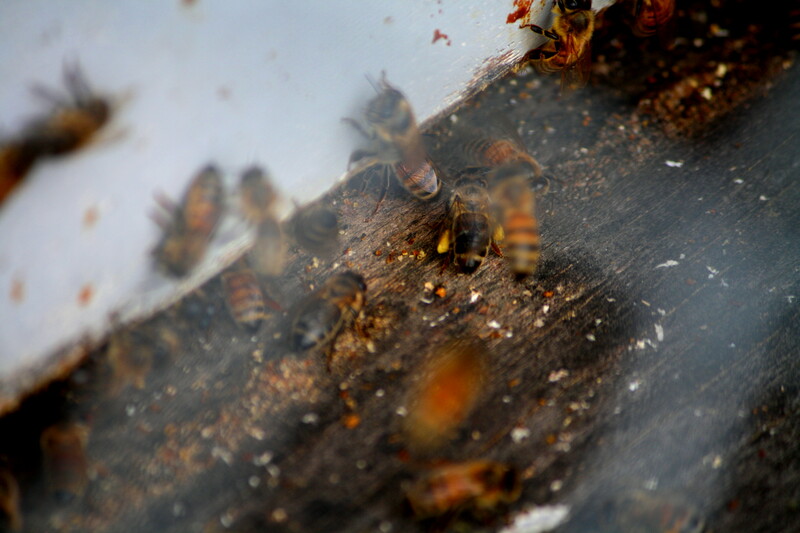 I took this photo of bees entering their hive earlier this week. Because the bees were moving too fast, and they were too small to get a point to focus on, I ended up with a general photo but not a crisp, pristine one. There were so many bees flying in front of the lens that the autofocus couldn’t pick up any one bee in particular. Added to that, I had to take the photo through chicken wire, so there is this hint of grey lines running across the frame. This photo is part of the Weekly Photo Challenge organised by WordPress. Check out this week’s entry and all the responses at HERE. 05 May	This entry was published on May 5, 2012 at 4:31 pm. It’s filed under Photos and tagged Bee, Canon, Kate Hobbs, Photo Challenge, Photograph, Weekly Photo Challenge. Bookmark the permalink. Follow any comments here with the RSS feed for this post. Thank you Rita. I appreciate your visit and your comment. I love your photo of the Christmas Tree. There is such movement in it. It works well. Thank you. Thank you Inga. I’m going to try and take some more of these bee-hives. They are in an orchard of a friend, pollinating the cherry trees. Bees are wonderful. Nicely unfocused. Thank you for the link. Merci! Vous êtes les bienvenus. And thank you for visiting me here too. Thank you Anne. I was struggling to keep my own eyes focused after a while, because of the bees moving across the lens. Thanks for visiting here. Hope to see you again. He He. Thank you. Welcome to my blog and I hope to see you here again. Thanks Jo. I’ll have to get some more photos of them and see what results I achieve. I love your pic! I love especially the pop in the centre that is focused! Thank you Lilly. Funny how a photo that I am not happy with brings a smile to others. Thank you for visiting.